I have decided to join the ShayLoss September challenge, so this morning I weighed myself to have a starting weight for the challenge. Found out that I gained 0,2 kg since last week, so my starting weight is 66,7 kg. 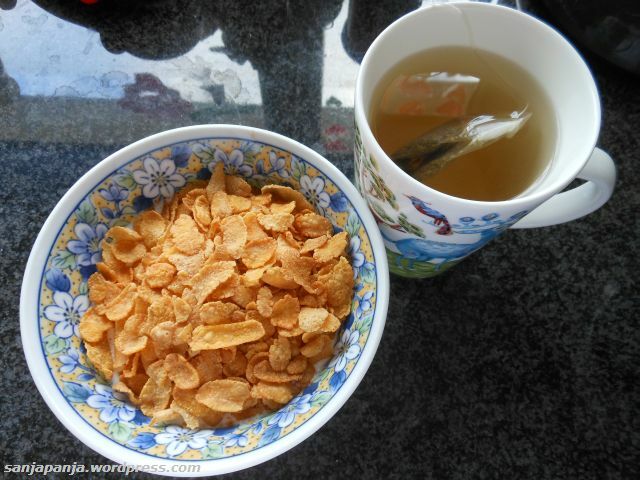 11:20 Breakfast: Yoghurt, cinnamon, shredded coconut and corn flakes and a cup of green tea. 14:10 Lunch: Mixed green leaf salad, carrots, cucumber, pine nuts, peach, avocado, feta cheese, scallion, corn and cherry tomatoes, served with a garlic-mustard dressing. After lunch we went to town to run some errands. On our way home we got a sms from a friend to ask us if we had gotten the invitation to their sons 2nd birthday BBQ. We had not!! And the BBQ had already started, so we went there. 18:50 Dinner: 3 chicken kabobs, 1 chicken wing, cucumber, carrot and 3 slices of french bread and some sauce. I skipped the birthday cake and dessert. 21:00 Had a small glass of Limoncello di Capri at the BBQ. When we got home and our daughter went to sleep, me and my husband did some push ups. I did 15-16-15. 23:00 Had some tea with my husband. Today I only drank water and tea and the Limoncelli. This entry was posted in Challenge, food, life, ShayLoss September and tagged 8 hours of sleep, avocado, BBQ, birthday, birthday celebration, birthday party, breakfast, carrots, challenge, cherry tomatoes, chicken kabobs, chicken wings, cinnamon, coconut, corn, corn flakes, cucumber, daughter, dinner, errands, feta cheese, French bread, garlic-mustard dressing, green tea, husband, Limoncello di Capri, lunch, mixed green leaf salad, no dessert, peach, pine nuts, push ups, sauce, scallion, ShayLoss September, starting weight, tea, water, yoghurt. Bookmark the permalink.